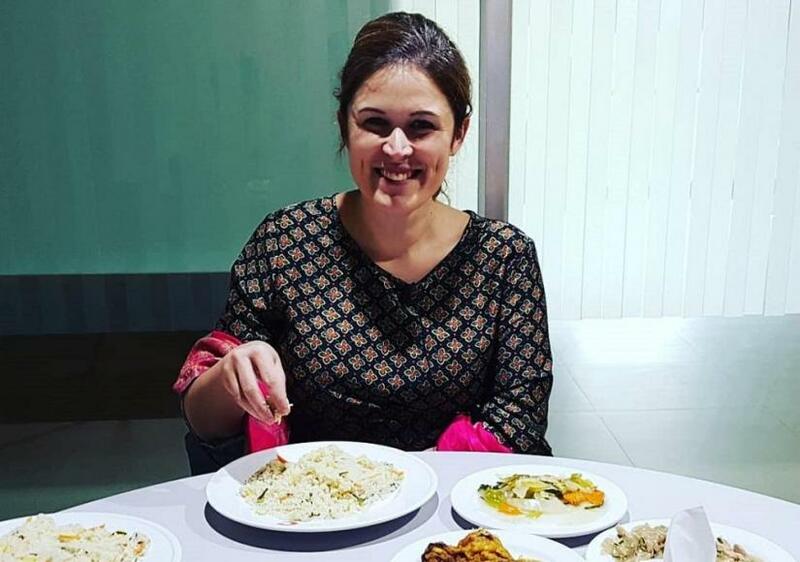 Bonn-based journalist Jessie Wingard enjoyed her month long visit to Dhaka to the fullest, visiting popular tourist haunts and getting a taste of the local cuisine. Jessie who works for Germany’s public international broadcaster, Deutsche Welle (DW) visited Bangladesh for the first time in September. Although Australian by birth, she is resident of Bonn, Germany, where the DW headquarters are located. During her stay she facilitated a five-day workshop on fake news in social media, verification and management, which was jointly organized by DW and RTV. Not only did she enjoy the rich and varied local cuisine, like a true Bangladeshi Jessie ditched the spoons and forks and ate with her hands. “It was an unusual experience. I really liked the country and their food was quite delectable,” she said. Every day she would make her way to the local restaurants near her hotel in Gulshan to sink her teeth into the delicious chicken items. However, from time to time she would sample the delicious naan, garlic naan, butter naan and the beloved biryani. She would also buy the street kids boiled eggs during her food rendezvous. She took a special liking to the spicy chicken khichudi, a staple of Bangladeshis on a rainy day. 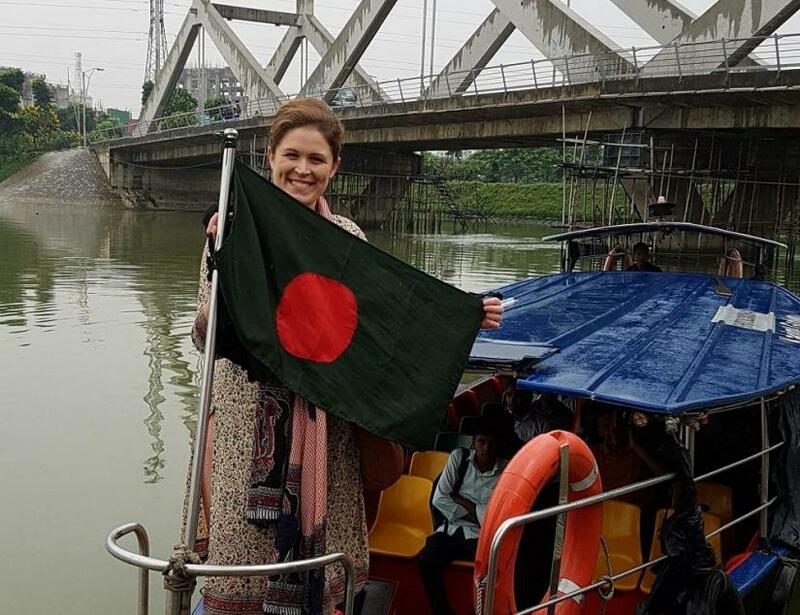 On Saturday (Oct 13), Jessie made her way to popular tourist spots in Dhaka including the Dhaka University (DU) campus, Shahid Minaar, Lalbag Kella and Aziz Supermarket in Shahbag. She first went to Hatirjhil and couldn’t bear to miss out on a boat ride. Her next destination was DU, a popular hub for local street food. Infront of TSC, she ate ‘bhelpuri’ to her heart’s content and declared that she won’t be forgetting the taste of it anytime soon. 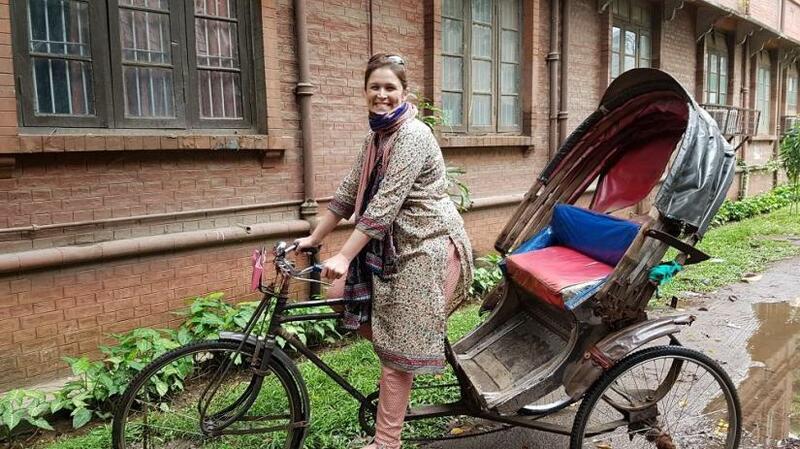 She then decided to go for a rickshaw ride around DU area and she took such a liking to the vehicle, she herself sat on the rider’s seat and took her interpreter Romana Akhter Shanta for a little ride. The workshop which was taking place in Tejgaon ended on Friday Oct 12. 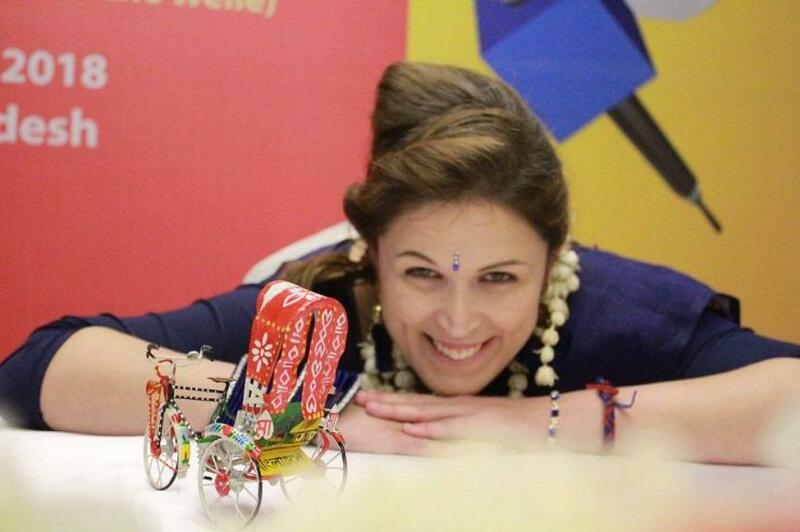 The foreign journalist wore a traditional saree from Aarong with bangles and flowers on her hair. The participants gave her a box full of ‘bindis’ and a little rickshaw showpiece as a token of remembrance. Jessie left on Sunday (Oct 14) and said that Dhaka was one of the friendliest cities she had ever visited and she would always remember unique rhythm and fragrance of Dhaka.